Black Ice Software - Fax Broadcast version 6.78 is released! Fax Broadcast version 6.78 is released! 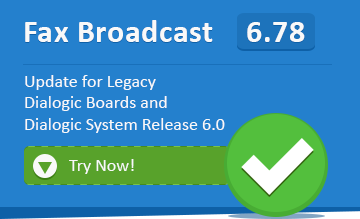 Legacy Dialogic Boards with Dialogic System Release 6.0! Black Ice Software has released Fax Broadcast version 6.78 which includes updates for Dialogic Fax Boards. In the latest released version, the Impact Fax Broadcast automatically recognizes the installed and configured legacy Dialogic boards with the Dialogic System Release 6.0 on the computer and the configured Dialogic Boards can be used. If an older version of Impact Fax Broadcast is already installed on the computer, simply uninstall the old version and install the latest version 6.78 of Impact Fax Broadcast to be able to use the Dialogic Boards for Fax Broadcasting. Version 6.78 of Impact Fax Broadcast includes improvements in the installation and uninstallation to enhance reliability and the user's experience, and also includes updated documentation. Download the Latest Impact Fax Broadcast!